Some of you may not realize that I'm a Petfinder.com cat. A TW search on that website brought her to my stunning face. She e-mailed the link to Pop and the rest is history. Pop fell in love with me and made me the Luckiest Pet in the World. Seeing as I'm all about me charity, I've entered the Petfinder.com Luckiest Pet of 2013 Contest. I've even used my Petfinder.com mug shot in my entry. From now until March 18th, I'll be axing for your votes. You're allowed to vote daily; one vote for each computer or mobile device person (wink, wink). The Grand Prize is a $500 Gift Card from Petco or Petsmart and a $5,000 donation in my name to a rescue designated by the Grand Prize Winner (approximate retail value: $5,500). Of course, you know that I've chosen A Call 4 Paws as my designated rescue. They're pawsome and they could use that money to build another indoor structure for the cats. It would mean so much for the quality of life of those cats when it rains or snows. There is one runner-up prize: a $250 Petco or Petsmart gift card. Click here for the direct link to my page. You will have to fill out some info for them or log in if you're a Petfinder.com member. I'd like very much to win that donation for Linda and her cats. I'm so serious that I've placed a call to Waffles at the FBI (Feline Bureau of Investigations) to see if he'll be my Campaign Manager cos Waffles Too might still be too young to know the ins and outs of politicking but his cuteness is always a bonus. 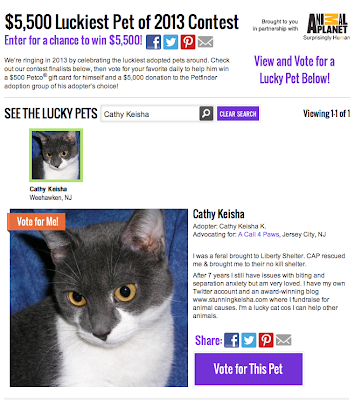 Please vote for me and the 80 cats at the A Call 4 Paws Cat Sanctuary. 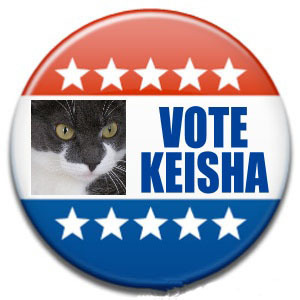 Those cats are counting on your votes. How awesome, CK - you totally deserve to win! I will go over and vote for you now! Our vote has been cast and we'll be back each day to do it again. Your eyes in that photo are extra stunning CK. We knew you had bootiful eyes before, but that photo really brings them out. we will bee mor N happee ta due this for ewe cathy keisha...best fishes N we trooly hope ewe N yur shelter winz !! oh kay, now we knead ta sound like dummeezz coz they wanna noe R videe oh provider ? uh....hhhmmmm???? We voted but had to pretend we are from NY as otherwise we could not fill in the fields. Have a terrific Thursday. How cool! And we love your entry picture! Voted and will continue to do so! GOOD LUCK my furriend! YOU deserve to win! Will head off to vote now CK! Good luck on winning! YAY...we getted R votez in thiz time N thanx for de videe oh tip coz we due knot haz cable ore a valid drivin licents !! Pooh it is USA only so sending you my love instead and best wishes for a win! We caught that wink-wink, CK! We took the hint-hint! MOL! We voted. It was easier than commenting here (blogger comments are giving us problems today)! We voted fro you CK!!! I voted and sent it out on Twitter and Facebook! We will be voting daily! Good luck, CK! We'll be voting for you! Ernie is a petfinder.com cat too!! Did you get ahold of Waffles One??? Is the FBI going to release him for your campaign??? We've got you covered on our end. Just keep reminding us to vote! I voted! I voted! I voted! Yes, it is formal. Wear your nicest furs. We sure will go vote. That is such a good thing for the shelter to get such a nice amount of money. Take care. Good luck, I hope you do win!!! We voted, we had hoped we could vote under more than one email address but it wouldn't let us. Boo, hiss. Hello sweet beautiful girl! I have voted for you....TWICE already! If there is any justice in this world, you will win -- although it did look to me as though there are over 4000 entries....gulp. Hey CK! Kozmo is from the Kelowna, BC Petsmart so I guess he is one too! We will be voting for yous grrrlfriend! You are the luckiest cat, my friend, of 2013 and I voted for you! Also, I voted your comment as the funniest for the prize at my Silly Saturday Photo Caption Contest! Please visit my blog to see how much we appreciated you and your caption!